Interview with The National's guitarist and co-songwriter, Aaron Dessner to talk about Denmark, art and his long-standing friendship with Mikkel Borg Bjergso. The National is arguably one of the most highly regarded rock bands to have emerged from the US in recent years, thanks to its knack for pairing memorable melodies with lyrical intimacy and heartfelt performance. They’ve also always struck me in interview as very thoughtful, humble musicians, with a great respect for craft. So I jumped at the chance to catch up with Aaron Dessner, the band’s guitarist and co-songwriter - in the midst of a US tour - to talk about Denmark, art and his long-standing friendship with Mikkel Borg Bjergso. Dessner’s connection to Denmark goes back a long way. As Aaron spent more of his time in Denmark, the friendship between the three flourished and, finding they shared many of the same interests and values, it wasn’t long before they began talking about ways of working together. ”The band was in town to play a big show at an arena called The Forum, and Jacob and Mikkel took us down to Refshaloen, a former shipyard where Mikkeller’s barrel room is now,” Aaron says. “It was this crazy post-industrial landscape, but Mikkel and Jacob told me the people who ran it were really cool. We started playing with the idea of holding an unconventional music festival out there; more than just bands on a stage. Aaron explains the name ‘Haven’ was chosen for its dual-meaning. In Danish, the word means ‘garden’, but in English it has connotations of being apart from the world, ‘a place for ideation and discovery’. First and foremost, this will take the form of collaboration, within and between the different creative disciplines represented there. ”The whole experience will be like an installation where all these various elements come together to stimulate the senses in different ways,” Aaron explains. “So, I’ll be playing with The National, but also with other musicians, some of whom I’ve never even met. I’ll also be working with people in other fields completely, which has always been one of my favourite things, whether it’s making a beer with Mikkeller, or collaborating with the Icelandic visual artist Ragnar Kjartansson. Everyone who’s involved has bought into creating a really special collaborative space.” The result, Aaron hopes, will be a ‘village atmosphere’, where people can move through a landscape of different experiences, participating and contributing, rather than simply consuming entertainment. In short, they’ve ‘created the kind of festival we’d want to attend”. In addition to The National, the festival’s eclectic line-up includes (at the time of writing): Chance the Rapper, Feist, Iggy Pop, The Danish String Quartet and Conor Oberst. Understandably, Aaron is full of praise for his partners Mikkel and Claus, and says the Mikkeller culture and values permeate the festival. ”This is the kind of experience Mikkeller is so good at creating,” he says. 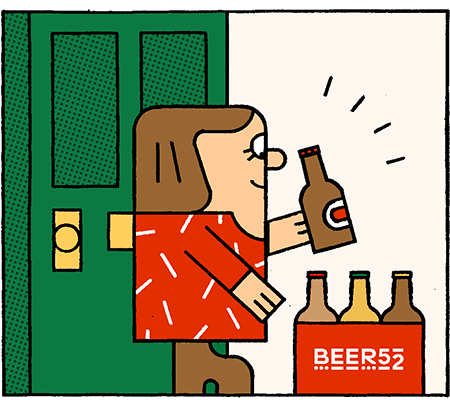 “You can go into any of those Mikkeller bars and feel that they’re related. The Haven festival is another outpost for that. We’re planting a flag and creating something of uncompromising high quality, saying ‘you can go to a music festival and have the best beer in the world, and the best food, and the most interesting cultural experiences’.” While the festival will run for two days in August, the site is also now the home of the Haven bar, a year-round expression of the spirit of escape and collaboration which drives the festival.